NASA’s MAVEN mission to Mars led by LASP and the University of Colorado Boulder will hit a happy milestone on Saturday, June 17: 1,000 days of orbiting the Red Planet. Since its launch in November 2013 and its orbit insertion in September 2014, the Mars Atmosphere and Volatile Evolution Mission (MAVEN) has been exploring the upper atmosphere of Mars, said LASP associate director and CU Boulder Professor Bruce Jakosky, principal investigator of the mission. MAVEN is bringing insight into how the sun stripped Mars of most of its atmosphere, turning a planet once possibly habitable to microbial life into a barren desert world. , indicating that there are dynamical processes of exchange of gas between the lower and upper atmosphere that are not understood at present. 9. Some particles from the solar wind are able to penetrate unexpectedly deep into the upper atmosphere, rather than being diverted around the planet by the Martian ionosphere; this penetration is allowed by chemical reactions in the ionosphere that turn the charged particles of the solar wind into neutral atoms that are then able to penetrate deeply. 8. MAVEN made the first direct observations of a layer of metal ions in the Martian ionosphere, resulting from incoming interplanetary dust hitting the atmosphere. This layer is always present, but was enhanced dramatically by the close passage to Mars of Comet Siding Spring in October 2014. 7. MAVEN has identified two new types of aurora, termed “diffuse” and “proton” aurora; unlike how we think of most aurorae on Earth, these aurorae are unrelated to either a global or local magnetic field. 6. These aurorae are caused by an influx of particles from the sun ejected by different types of solar storms. When particles from these storms hit the Martian atmosphere, they also can increase the rate of loss of gas to space, by a factor of ten or more. 5. The interactions between the solar wind and the planet are unexpectedly complex. This results due to the lack of an intrinsic Martian magnetic field and the occurrence of small regions of magnetized crust that can affect the incoming solar wind on local and regional scales. The magnetosphere that results from the interactions varies on short timescales and is remarkably “lumpy” as a result. 4. MAVEN observed the full seasonal variation of hydrogen in the upper atmosphere, confirming that it varies by a factor of 10 throughout the year. The source of the hydrogen ultimately is water in the lower atmosphere, broken apart into hydrogen and oxygen by sunlight. This variation is unexpected and, as yet, not well understood. 3. MAVEN has used measurements of the isotopes in the upper atmosphere (atoms of the same composition but having different mass) to determine how much gas has been lost through time. These measurements suggest that 2/3 or more of the gas has been lost to space. 2. MAVEN has measured the rate at which the sun and the solar wind are stripping gas from the top of the atmosphere to space today, along with the details of the removal processes. Extrapolation of the loss rates into the ancient past — when the solar ultraviolet light and the solar wind were more intense — indicates that large amounts of gas have been lost to space through time. 1. The Mars atmosphere has been stripped away by the sun and the solar wind over time, changing the climate from a warmer and wetter environment early in history to the cold, dry climate that we see today. 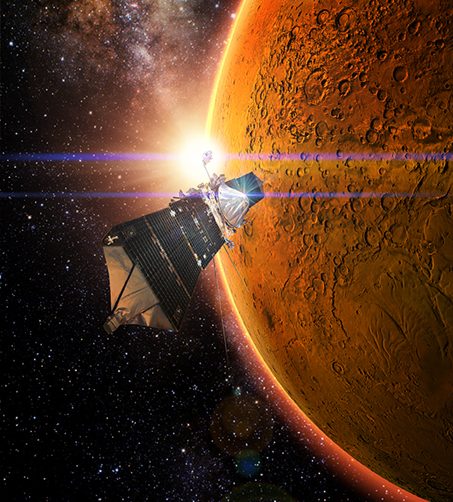 MAVEN began its primary science mission on November 2014 and is the first spacecraft dedicated to understanding Mars’ upper atmosphere. The goal of the mission is to determine the role that loss of atmospheric gas to space played in changing the Martian climate through time. MAVEN is studying the entire region from the top of the upper atmosphere all the way down to the lower atmosphere so that the connections between these regions can be understood. LASP provided two science instruments for the mission and leads science operations, and education and public outreach. NASA’s Goddard Space Flight Center manages the MAVEN project and provided two science instruments for the mission. Lockheed Martin of Littleton, Colorado, built the spacecraft and is responsible for mission operations. The University of California at Berkeley’s Space Sciences Laboratory also provided four science instruments for the mission. NASA’s Jet Propulsion Laboratory in Pasadena, California, provides navigation and Deep Space Network support, as well as the Electra telecommunications relay hardware and operations.